Beverly Shear Mfg. was established in 1931 in Illinois. They currently occupy the oldest building in Chicago, IL. Beverly throatless shears are ideal all-purpose metal cutting tools because they allow any desired cut in heavy gauges, yet handle lighter metals without distortion. Uniquie sholder design allows work to be turned in any position during the cut. It features a geared rack and pinion which makes heavy metal cutting easy. Upper and lower blades are positioned to provide a clean, knurl-free cut, regardless of material thickness. 1. Alloy Steel rack and pinion gives great power with little effort. 2. Removeable handle for easy portability. 3. Alloy steel body designed to give maximum rigidity and strength. 4. Adjustable hold down (B-3 only). 5. Highest grade blades have correct rake to provide clean, burr-free cutting. Blades are adjustable for wear and are quickly interchangable. 6. Alloy steel pivot point. 7. 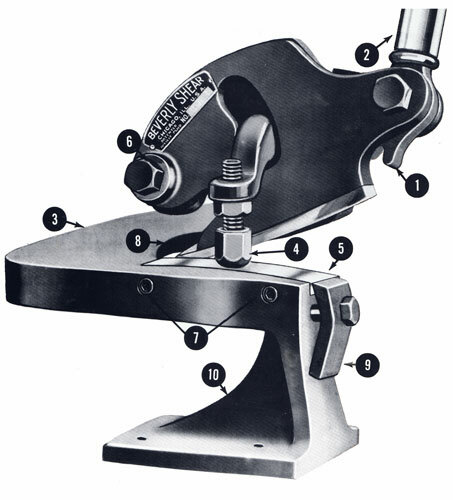 2-point lower blade adjustment. 8. Exclusive design of shoulder permits turning work to any shape or position. 9. Lower blade retaining clamp is keyed to keep blades light and rigid. 10. Steel base drilled for mounting shear on stand or bench.